Cladding is the process of bonding various materials, in our case only natural stone or brick slips (tiles or veneers) to a wall, using adhesives and mortars. 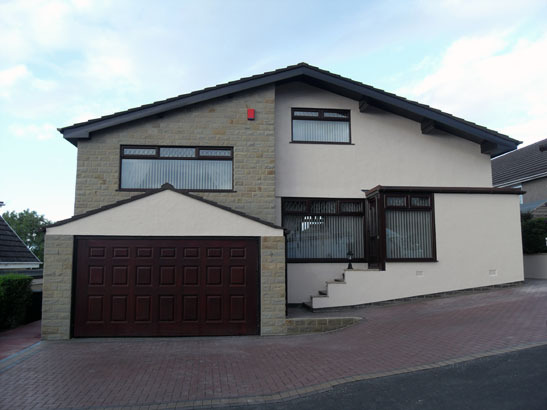 The external cladding gives the impression that the wall is constructed of the newly attached brick cladding or stone cladding slips for decorative effect. Click for a closer look at the process of External Wall Cladding. For a Free External Wall Cladding Quote or Wall Survey* click 'Request Free Quote' on the right of this page and fill in your details, or call us free on 0800 500 3146. We are professional wall coatings and external wall cladding company, professionally installing natural stone cladding and brick cladding UK wide. If you would like cladding professionally installed on the exterior of your house or external building, or have any structural question relating to exterior cladding or external walls, type your question in our 'Quick Query' section on the right hand side of this page and one of our expert wall surveyors will be in touch. Wall cladding is a popular choice in major and minor renovation projects as it can add a certain elegance to a property, but there are reasons other than the beautiful aesthetic finishes to install external wall cladding. Cladding Can Transform Any Wall: External wall cladding can be applied to any structurally sound wall surface. This means any wall regardless of its composition or current protective application can be stripped back and transformed from ugly, unappealing walls into a stunning wall clad finish. 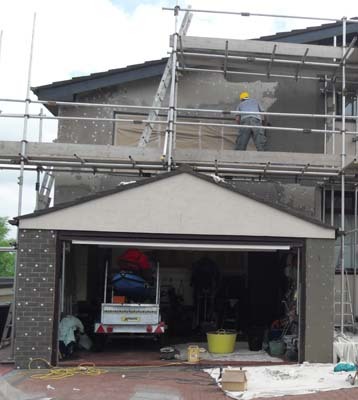 Maintenance Free Walls for Life: Once brick cladding or stone cladding has been installed on a property, if done professionally, it will never need to be re-applied again. As no further work is required on the external walls, this external cladding installation becomes a one off investment therefore providing peace of mind that the exterior walls of a property will remain maintenance free therefore cost free for life. Replacing Blown Stone or Brick with Cladding: There are occasions where a technical use of external wall cladding is considered the best solution. There have been occasions where we have visited old buildings, where the faces of 200 year old bricks had begun to blow (This was caused by incorrect application of cement based pointing the year before). The remedy was to replace the cement based mortar with a lime based mortar to prevent further brick deterioration and to apply external cladding using the same bricks over the blown defaced bricks. The alternative solution was replacing the bricks entirely, but this was a far more intrusive method, possibly affecting the structure of the building. service with our external cladding installations. A typical use for this service would be for example, a house owner constructing an extension on an old stone house. With the use of external cladding, the house owner has the freedom to use the most suitable material for construction of the extension, while we match then clad this to keep in character with the existing house, leaving a beautiful seamless finish. In the two pictures above, our customer took advantage of our brick matching service, to ensure the new external cladding installation matched the current red brick of the house. Click these pictures for a closer look. Keeping it Lightweight: The mass of a structure is another technical reason for and external cladding installation. If a new build property or an extension is being constructed and the required finish, must for example match an existing building, there are sometimes concerns regarding the new structures weight. We came across an example of this, when a second storey was to be added to a ground floor building. There were concerns regarding the strength of the original footings regarding the ability to support a second floor made from solid stone. Instead of building the structure with natural stone, the structure could be constructed with far lighter materials (such as breeze block) and cladded with the natural stone. This would give exactly the same effect, but would be an estimated 1/3rd of the stone built weight! Keeping You Warm with Thermal Cladding: An option growing in popularity, is the combined use of exterior wall insulation (EWI) with a wall clad finish. The external wall insulation option is generally only advised for properties without the option to insulate using cavity walls, mainly due to the difference in cost between cavity wall insulation and external wall insulation. In the process of installing thermal cladding, insulation boards are mechanically fixed to the wall and the cladding is then bonded on top, providing both a highly efficient thermal barrier coupled with an aesthetically pleasing, seamless, cladded finish. We are professional exterior wall cladding installers offering a range of thermal cladding options, for more information, free residential external wall advice or a free no obligation quote, simply fill in your details in our 'Quick Query' section on the top right side of the page, you can call us on 0800 500 3146 to speak directly with one of our professional wall surveyors or simply click here to send us an email. 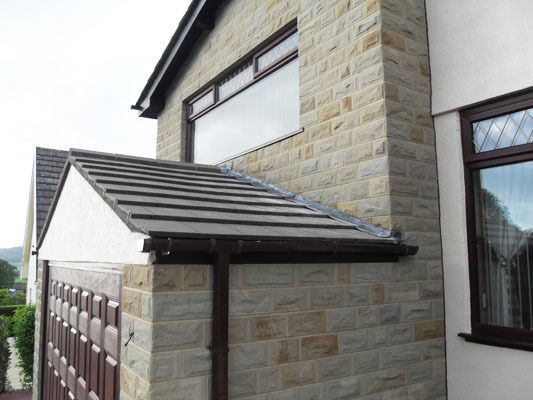 As mentioned previously, we only install stone cladding and brick cladding at present, available in many types, colours and styles with the added option of including exterior wall insulation with the installation. then milling the stone down to a usable size. There are many different sizes, shapes and patterns available. 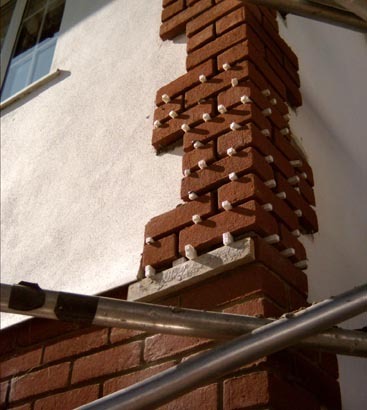 In all our years installing wall cladding, we have managed to match 100% of existing brick work and stone work using our brick or stone cladding matching service. 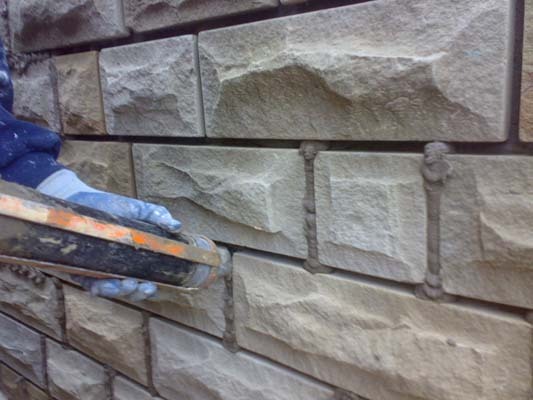 Therefore we are very confident we can supply you with specific stone cladding, for matching existing masonry. 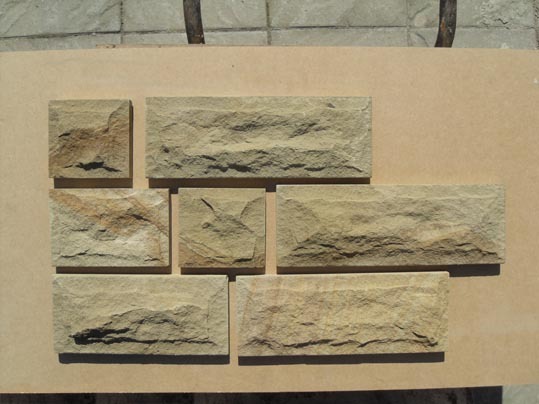 Click the picture inset for a closer look at some typical natural stone cladding tiles. York stone tiles are one of our most popular styles, cut to a standard 140mm height with a varying length. This style offers neat clean horizontal lines with random vertical or perpendicular joints. The stone can be mitred at 45 degrees on the external corners to give the desired appearance of full stone slabs. To finish the work, the corner is grouted using colour matched grout to give a beautiful seamless finish. It is possible to clad buildings in almost any weather resistant stone material. For example although buildings are very rarely constructed with marble today, marble cladding can be applied to buildings, which provides the same stunning grand effects. different styles, types, colours and sizes. Avant Coatings Ltd has a large library of brick slips available which are manufactured for us as brick tiles. The tiles are usually between 10mm and 15mm and are also available as L shaped pistols, which are used when cladding corners giving a seamless finish. This picture shows an example of the various stages of the cladding process. Here you can see the mesh attached to the backboard, a render applied to the mesh surface, then brick tiles attached and pointed. Click the picture to see this in more detail. Exmaples of Insulated Cladding: As mentioned previously, we offer a thermal insulation cladding range, which is typically used as part of an external wall insulation solution. Thermal insulated cladding can offer great money saving on heating bills (and even cooling bills) throughout the year. 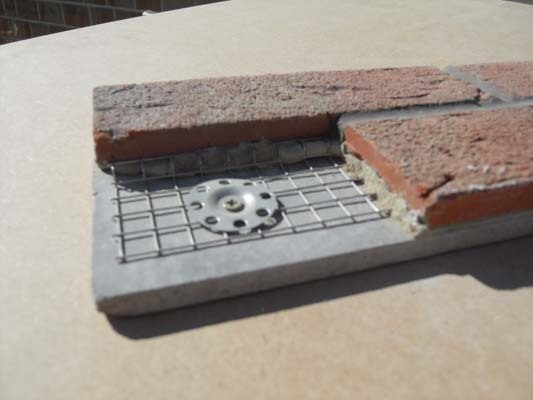 An insulation board is fixed to the exterior wall using adhesives and mechanical fixings. There are a range of insulation materials to choose form including Phenolic board (very low thermal conduction), Expanded Polystyrene and Mineral Fibre (fire resistant). There are also great eco-friendly options such as compacted mineral wool and wood fibreboards which all have their own advantages. Upon installation of insulated cladding, consideration needs to be given to window cills, pipes, vents, wires, eve overhang, boiler flues etc, this is because the external wall of your property, once applied will be thicker, meaning flues, vents and window cills have to be extended. Once the insulating material is in place, the boards are then skimmed using a polymer render with a nylon reinforcing mesh. Finally, the cladding is then adhered to the insulation board and pointed to achieve that perfect finish. For a successful wall cladding installation, it is essential, as with any wall application, that the wall is solid and sound. 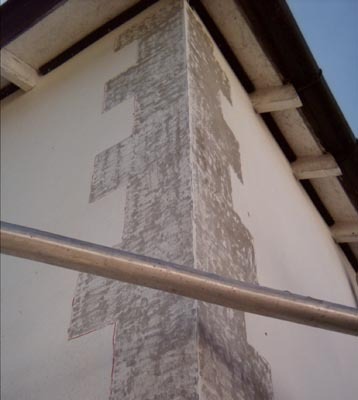 This means stripping any loose flaking material back, then applying a render where required to provide a solid base to work from. 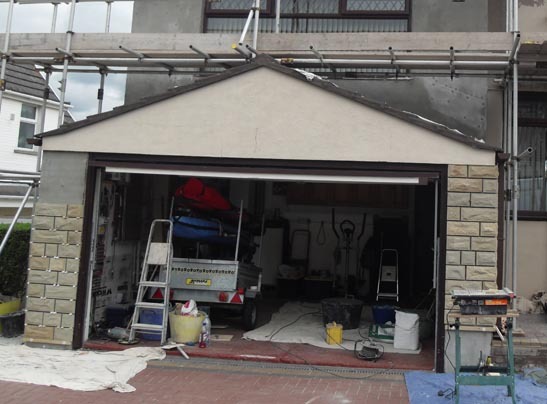 Once rendered and the cladding veneers have been installed, the spacers are removed and the gaps between the stone tiles are pointed, it is essential this process is completed properly. cladding installation. It is particularly important that sufficient material is used in the gaps when pointing cladding, leaving no gaps behind the pointed finish. Pressure pointing ensures this is completed properly. 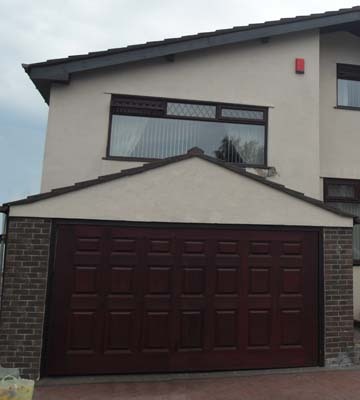 The pointing material used depends heavily on the composition of the underlying wall and the cladding slips used, but is available in a wide range of colours to compliment the new cladding or to match the colour of any existing pointing. If you require the services of a professional wall cladding company, simply click 'Request Free Quote' on the top right of this page and fill in your details, or call us free on 0800 500 3146. Our Quotes and wall surveys* are free of charge and with absolutely no obligation. If you have any question regarding exterior walls, use our 'Quick Query' section at the top of this page and your question will be answered by one of our wall surveyors.